Vilkas is a Nord warrior and a werewolf, usually found within Jorrvaskr in Whiterun. 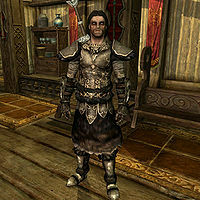 He is a member of the Circle, a faction within the Companions, alongside his twin brother Farkas. Vilkas is a master trainer in the Two-handed skill. When the Companions questline is complete, he becomes a potential follower and marriage candidate. Vilkas's outfit consists of a set of wolf armor, with matching gauntlets and boots, but minus the helmet. He also carries around a banded iron shield and his sword. He is usually found around Jorrvaskr. However, if he becomes recruited as a Blade, he will then reside in Sky Haven Temple. If you ask who the Companions are, he will answer: "You'll hear some of the brighter faces around here talk about honor and glory. I've got nothing against it, but for me, the promise of coin is what feeds my blade. Wherever someone in Skyrim doesn't feel up to defending their own honor, we'll take up their burden." If you ask as to why he joined, he will elaborate: "To hear Farkas tell it, our father raised us here as happy pups, running around biting knees. I love my brother, but his brains are not his strong suit. We were brought here by Jergen. Whether he was our father or not, I don't care. He left to fight in the Great War and never came back. So he's not my problem anymore. We've been here as long as either of us can remember, though. So try to show some respect." After joining the Companions, if you ask what it means to be a Companion, he will explain: "There's been a group called the Companions for over 4000 years. It's been many different things in that time. A conquering army. Ruthless mercenaries. A band of drunken louts. And the esteemed company you see before you. But there's always been a kind of honor to it. We don't deal in politics or underhanded sneaking. We try to uphold the legacy of Ysgramor. To bear his good name such that it never be forgotten, and always be spoken with reverence." Also confronting him on where he stands on the current war, he will blatantly tell you: "There are always good reasons to fight. I just wish this war had them. Who cares who worships what dead god? Give me something to make me draw my sword." If you choose to ask his opinion on being a werewolf before Blood's Honor, Vilkas will be quick to dismiss your question: "I don't know what you're talking about. But if I were you, I'd hold my tongue." However, if you ask the same question after becoming initiated within the ranks of the Circle, he will answer very differently: "I've enjoyed the boons that come with beastblood. Just like every member of the Circle. Kodlak is right, though. We've given a piece of our souls for this power. I know my mythic histories. Bargains like that lead to ruin. This is a curse that was laid upon us. That much is clear." Take Up Arms: Prove you are worthy to join the Companions. Purity of Revenge: Retrieve the Fragments of Wuuthrad and wipe out the Silver Hand. Glory of the Dead: Cure Kodlak's spirit and become leader of the Companions. 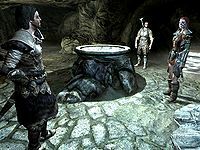 Dragon Seekers: Go to a dragon lair with Farkas or Vilkas and kill the dragon. Escaped Criminal: Fulfill a contract given to the Companions to hunt down an escaped criminal. Family Heirloom: Fulfill a contract for the Companions to retrieve a stolen family heirloom. Purity: Help a member of the Circle give up their beasthood. Rescue Mission: Fulfill a contract given to the Companions to rescue a kidnapped citizen. Rebuilding the Blades: Recruit new members for the Blades. Vilkas: "But I still hear the call of the blood." Kodlak: "We all do. It is our burden to bear. But we can overcome." Vilkas: "You have my brother and I, obviously. But I don't know if the rest will go along quite so easily." Kodlak: "Leave that to me." "But I still hear the call of the blood." Vilkas: "Master, you're not truly considering accepting him/her?" Kodlak: "I am nobody's master, Vilkas. And last I checked, we had some empty beds in Jorrvaskr for those with a fire burning in their hearts." Vilkas: "Apologies. But perhaps this isn't the time. I've never even heard of this outsider." Kodlak: "Sometimes the famous come to us. Sometimes men and women come to us to seek their fame. It makes no difference. What matters is their heart." Kodlak will question your skill in combat. Regardless of what you say to him he will direct you to follow Vilkas out into the courtyard for training practice. If you ask him if he's supposed to train you before you reach the yard, Vilkas will tell you: "Not here. Out in the yard. Come on." Once you've exited out into the courtyard, Vilkas will then explain: "The old man said to have a look at you, so let's do this. Just have a few swings at me so I can see your form. Don't worry, I can take it." Depending on your performance, he will comment on your skill. Afterwards, he will then order you around: "You might just make it. But for now, you're still a whelp to us, new blood. So you do what we tell you. Here's my sword. Go take it up to Eorlund to have it sharpened. And be careful, it's probably worth more than you are." After Kodlak has been slain by members of the Silver Hand upon your return back to Jorrvaskr, Vilkas is looking to seek revenge for his death and asks you to accompany him to Driftshade Refuge and to retrieve the fragments of Wuuthrad. He will say either: "We're going to make them pay." "Those bastards will regret raising their weapons against Jorrvaskr." or "Let's get back to Jorrvaskr. We'll want to pay our respects to Kodlak's spirit." Once you return from Driftshade Refuge, Vilkas will tell you: "We did well today, Shield-Brother/Shield-Sister." and continue to inform you about Kodlak's funeral: "The others have probably prepared Kodlak's funeral by now. Come up to the Skyforge to pay your respects." "The old man had one wish before he died. And he didn't get it. It's as simple as that." Vilkas "The old man had one wish before he died. And he didn't get it. It's as simple as that." Aela: "Being moon-born is not so much of a curse as you might think, Vilkas." Vilkas: "That's fine for you. But he wanted to be clean. He wanted to meet Ysgramor and know the glories of Sovngarde. But all that was taken from him." Aela: "And you avenged him." Farkas: "Kodlak did not care for vengeance." Vilkas: "No, Farkas, he didn't. And that's not what this is about. We should be honoring Kodlak, no matter our own thoughts on the blood." Aela: "You're right. It's what he wanted, and he deserved to have it." Vilkas: "Kodlak used to speak of a way to cleanse his soul, even in death. You know the legends of the Tomb of Ysgramor." Aela: "There the souls of the Harbingers will heed the call of northern steel. We can't even enter the tomb without Wuuthrad, and it's in pieces, like it has been for a thousand years." At this point, Eorlund will enter, carrying the legendary Wuuthrad. Eorlund: "And dragons were just stories. And the elves once ruled Skyrim. Just because something is, doesn't mean it must be. The blade is a weapon. A tool. Tools are meant to be broken. And repaired." Vilkas: "Is that? Did you repair the blade?" Eorlund: "This is the first time I've had all the pieces, thanks to our Shield-Brother/Sister here. "The flames of a hero can reforge the shattered." The flames of Kodlak shall fuel the rebirth of Wuuthrad. And now it will take you to meet him once more. The rest of you, prepare to journey to the Tomb of Ysgramor. For Kodlak. As the one who bore the fragments, I think you should be the one to carry Wuuthrad into battle." "Kodlak was right. I let vengeance rule my heart." You are now directed to meet the rest of the members at Ysgramor's Tomb. Upon your arrival, asking if this is the tomb, he will elaborate: "This is the resting place of Ysgramor. And his most trusted generals. You should be cautious." Asking him specifically what he meant, he will continue: "The original Companions. Their finest warriors rest with Ysgramor. You'll have to prove yourselves to them. It's not that you're intruding. I'd wager they've actually expected us. They just want to be sure that you're worthy. Be ready for an honorable battle." Inquiring as to how to get inside, Vilkas will tell you: "Return Wuuthrad to Ysgramor. It should open the way." Also asking him if he's not coming, he will sadly admit: "Kodlak was right. I let vengeance rule my heart. I regret nothing of what we did at Driftshade. But I can't go any further with my mind fogged or my heart grieved." Once you've cleansed Kodlak's spirit and become the Harbinger of the Companions, you are able to cleanse Vilkas' spirit during the quest Purity. Vilkas is in the faction GuardFaction (makes an actor a guard). This makes him chase you on sight when you have a high bounty in any given hold. A bug during the quest Purity of Revenge may cause him to run and cower whenever an enemy is sighted instead of help you fight. 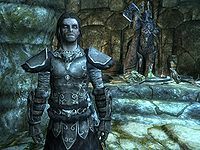 Before the quest Take Up Arms or after the completion of Glory of the Dead, Vilkas may be encountered roaming Skyrim with Ria as a random encounter. In Lithuanian "Vilkas" means "wolf" . Vilkas has an unused dialogue choice where he can be asked "What's it like being a werewolf?" and he would reply "I don't know what you're talking about. and if I were you, I'd hold my tongue." If recruited as a Blade, he will travel back to Jorrvaskr instead of staying in Sky Haven Temple. ? If you leave Whiterun while training with Vilkas, you may not be able to buy or sell with any merchant, gain dragon souls, or interact with any NPC, nor will you be able to have a follower as they will not follow after being asked. ? Due to his status as a guard, he may start to follow you around and initiate dialogue repeatedly if you have a bounty. This can continue to happen even after you have removed the bounty, and may also prevent fast travel. Regaining a small bounty (even a zero value bounty) and then paying it off with a guard may fix this. This can be corrected by entering the following console command: paycrimegold 0 0. He may sometimes attack you if you transform into a werewolf. If Hearthfire is installed, he may not have the "How are the kids?" dialogue option. He may stop offering radiant quests after you retrieve the fragment of Wuuthrad from Dustman's Cairn. ? 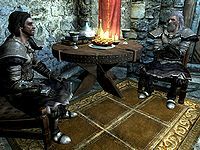 After finishing the companions quest line, he or Farkas may not have a dialog option to get work from them, thus making the purity quest impossible. ? This is usually not a bug as it usually occurs when taking only one Glenmoril Witch's head during Blood's Honor quest. First acquire all or at least two for both Vilkas and Farkas (there are five heads in total). Then head back to Jorrvaskr and speak to Farkas or Vilkas (whoever didn't have quests to give) and they will start their Purity quest. Once that is complete they should start to give out normal quests again. You cannot sleep in Vilkas' bed to gain the Lover's Comfort bonus if you've agreed to stay at his home. You can, however, sleep in your own bed in the Harbinger's room to gain the bonus. This page was last modified on 12 November 2018, at 13:06.